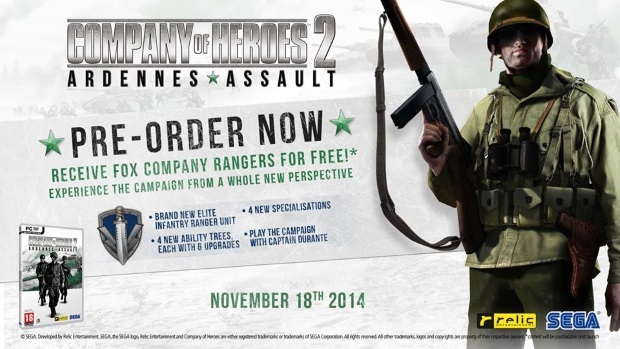 SEGA® of America, Inc. and SEGA® Europe Ltd. today announced a pre-order incentive for Company of Heroes 2™: Ardennes Assault consisting of an all-new Company known as “Fox” Company. This band of Rangers is led by Captain Monte Durante and sits alongside the three Companies already included in the game; Airborne, Support and Mechanized. Players can choose up to three Companies on a campaign play-through; each with its own unique play style, specializations, abilities and Officer. To celebrate the announcement, SEGA and Relic will be running a free weekend on Steam for Company of Heroes 2™ and Company of Heroes 2™: The Western Front Armies from 10AM PST/6PM BST/7PM CET, Thursday October 16, 2014 until 10AM PST/6PM BST/7PM CET on Monday October 20. Steam users will be able to download and play the game for free during this period, so there has never been a better opportunity to try out the series. There will also be various price promotions on Steam for Company of Heroes 2 running alongside the free weekend should players want to make it a permanent addition to their gaming library, including 75% off of Company of Heroes 2 and 66% off of Company of Heroes 2: The Western Front Armies. Check the Steam product pages during the promotion for more information.